ELV is of two minds about Lakeside. Plus, we’ve never really forgiven the Wynncore for running off Daniel Boulud from this spot. (“Running off” may be a bit of an exaggeration — the truth is, after five years of dealing with the penny ante politics of the Wynn’s F & B hierarchy, Boulud was off like a prom dress as soon as his five year deal expired. And who could blame him?) 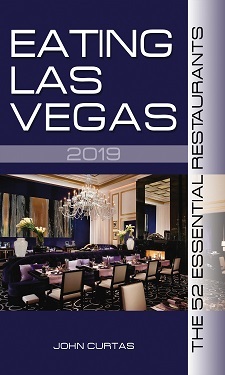 But there’s no doubt, for the first couple of years of its existence, when Philippe Rispoli was at the helm, it was one of the finest restaurants Vegas had ever seen. …that was deeply satisfying and practically guilt-free — in other words, just about the perfect dessert. So is there anything to dislike about Lakeside? Not really. The place is gorgeous and comfortable (notwithstanding the Chilewich place mats), the service top notch (criticize the Wynncore’s restaurants all you want – and we have – but the service throughout the hotel is unfailingly excellent), and the cooking is done to a fare thee well. But there’s something missing. And what’s missing isn’t unique to Lakeside. It’s what’s missing in any number of restaurants in Vegas. It’s the missing component that makes the rest of the food world look upon us with disdain — no matter how excellent our final product is. It is the thing that foodies yearn for and critics sense the presence or absence of like a wolf sniffing the wind. And that thing, that missing component, that je nais se quoi is passion. Individuality. An intensity of purpose driving things beyond the need for a business to “make its numbers” according to the dictates of its corporate masters. All restaurants are businesses, of course, and all need to crunch their numbers to survive, but big, expensive hotel restaurants that exist by committee will never garner the respect of smaller places that reflect the vision of a single person. In other words, if it had an identity. And those three dishes above would be a great place to start. John, I love your reviews, but I sense you’ll never be able to enjoy the extraordinary options your fine city has to offer because it’s not there for your perspective. As much as I LOVE Las Vegas, it’s not New York, or Chicago, or San Francisco. The entirety of these establishments exist not for you, the local. But rather for me, the visitor. And nowhere else can I find such a wealth of truly “wow” options for dining like along a few miles of the Las Vegas strip. This is the reason I imagine you will become more and more intrigued with the likes of Alex Stratta, now that he has gotten off the strip and is striving to cultivate that local food culture. But the very thing you lament- the large resorts, the “something-for-everyone” spot, the “hit your numbers” approach…. well, those are the mechanisms that allow an utterly obscene bevvy of options to remain. It’s good to see you enjoying the food. But I suggest you take it at face value. I would kill to have the selection of options- both on and off the strip, at my disposal that you do. As a critic, one must see a restaurant’s problems, not only how they impact the consumer. Sometimes, I think you take your experiences too personally-and though I realize any customer will do so, your role is slightly different. A critic is an ombudsman for sure, but also knows more about how restaurants work behind the scenes. Walzog has lots of passion, as you imply. Cut him some slack. Lakeside is impressive. On the other hand…. A bright orange motif and fine dining go together like popcorn and cottage cheese! The soul & passion of a restaurant is communicated through it’s staff. A chef & GM can ramble all they want about Food/Wine/Service being their passion, but if the staff hasn’t bought in, you will end up with an experience that resembles that of an amusement park ride. Keep your hand & arms inside at all times / We are not responsible for lost personal items….etc. A good chef & GM team should be able to pacify the nonsense that the executives heap on them, but never let that trickle down to the guest experience. It’s a tricky exercise, but it can be done. Every restaurant in Vegas has an element of fake. It has to be that way. I suppose a meal outside in 115 degree heat surrounded by Rocks & tumble weeds would be a more authentic Vegas experience, but I will take great food by a fake lake any day…. Hello John been a while since I have chimed in here. My wife and I have become somewhat foodies (whatever that means) We travel a lot, we love to eat and drink, and we have the means. We have been on a quest for the last 3 years to hit the worlds 50 best spots. This is an ever changing quest but we have been fortunate to hit 19 that are on this years list over the past 3 year. This along with a 6 hour marathon at elbulli 2 year ago. Last Wednesday we went to Picasso for the first time. Not sure why but we just have not gone there for some reason. I think after one of your last blogs I decided we needed to go there. Wow what a great space, flowers everywhere and of course the art. Fantastic service, but the food. Good but not great. The tab for the food alone without out wines etc was $300 for the two of us. We dropped $550, not on an expense account BTW and I left disappointed. When a place is as big as this and the number of covers they do the food just has to become somewhat institutional. Too bad, I have to agree with you John passion seems to be missing compared to many other spots I have traveled to around the world. One mark of a qualified Food Writer is one who can, in fact, be fully honest in expressing his or her personal experiences to the reader–who can then interpret those words and make a decision as to whether or not they choose to dine at that restaurant. I myself am often criticized, yet at the same time applauded, by my readers for being so intensely personal in sharing my thoughts about a restaurant. The critic with knowledge of what takes place in the kitchen and in the boardroom makes their reviews all the more interesting. That’s what I admire about reading ELV. If you are avid about dining, don’t despair that there is a lack of creativity in and passion in all of the kitchens in Las Vegas, Wynn properties notwithstanding. Order the “Escargot and Glazed Chicken Oysters” or the Offal specials on Thursday nights. (Last week I had the “Pork Cheek and Pig Tail,” entree). You’ll be tasting the food of some of the passionate cooks in Las Vegas. Edit my above post to qualify, “Order the “Escargot and Glazed Chicken Oysters,” presented by Chef Brian Howard at Comme Ca…..